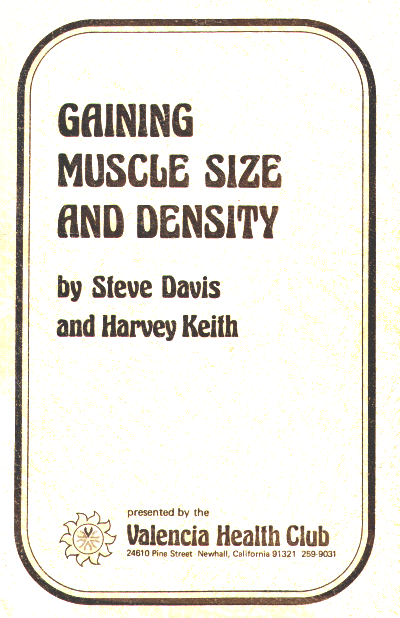 The most informative and professional course on the physical culture market for gaining muscle size and density. At the Valencia Health Club, we have instructed hundreds of men who were attempting to add muscle density. Over the years, we have found that almost all the students have responded well to these key, muscle producing exercises. Through much trial and error and experimentation, we have also devised the optimum method of employing sets and repititions to these same exercises to produce the fastest possible results. As a trainee, you should feel a sense of security as you embark on this endeavor, as you are receiving a training program that has already been proven SUCCESSFUL.